Queen Sarah asked for sting blocks. I love string blocks! This is my first time making them without a foundation, but Sarah suggested using a 12 1/2" square ruler to be sure none of the strings came up short, and that worked great. She requested that blocks be left untrimmed, which was hard, but I did as I was told. It's amazing how long remnants can continue to pop up! I had a lot of fun with these blocks. Regular readers here will know that I love novelty fabrics. Love, love, love novelty fabrics. 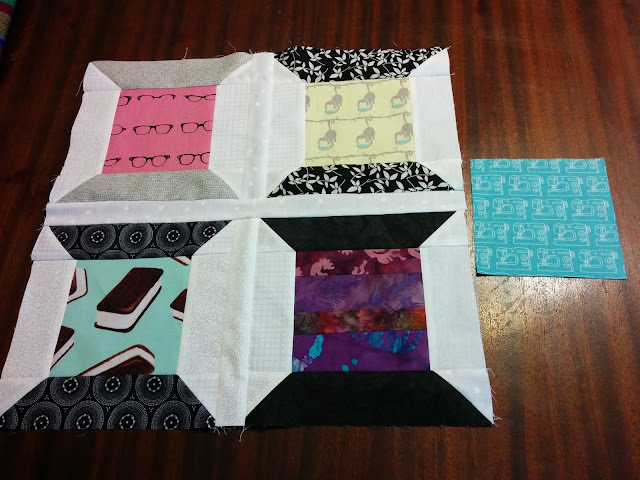 So when Tracy from Hive 6 asked for a block featuring 5" novelty squares, I had to crash. I knew that I could potentially spend hours on fabric selection going through my 5" I Spy squares, so I grabbed a container that just had extras from fabrics I'd bought (as opposed to from swaps) and went with my gut. Tracy asked her hive for blocks that represented each of them. I went with monkeys with monkey babies, because Husband is monkey-crazy and we have our own little monkey. Glasses because it was one of the first novelty fabrics I bought for an I Spy swap, I wear glasses, and they are associated with my profession (librarian). Ice cream sandwiches because, well, because ice cream sandwiches are awesome and that fabric is awesome. The requirement was at least one string block and I used purple batiks, because that plus novelty fabrics sum me up pretty well. I also included a 5" of a sewing machine print hoping that Tracy can use it in another block or another project. Because that machine represents us all, right? So cool!!! I love the blocks and those spool ones are very you!